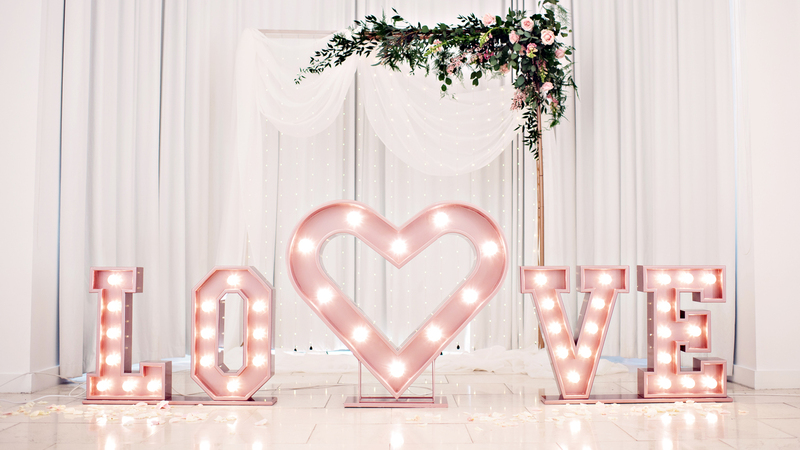 Ready for something super, duper pretty? 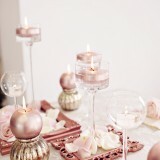 Well surely it doesn’t get much prettier than a styled shoot inspired by every girl’s current favourite colour, rose gold?! Glamorous, feminine and fun, what’s not to love about this on-trend hue, which is making a stylish statement on the wedding scene right now. 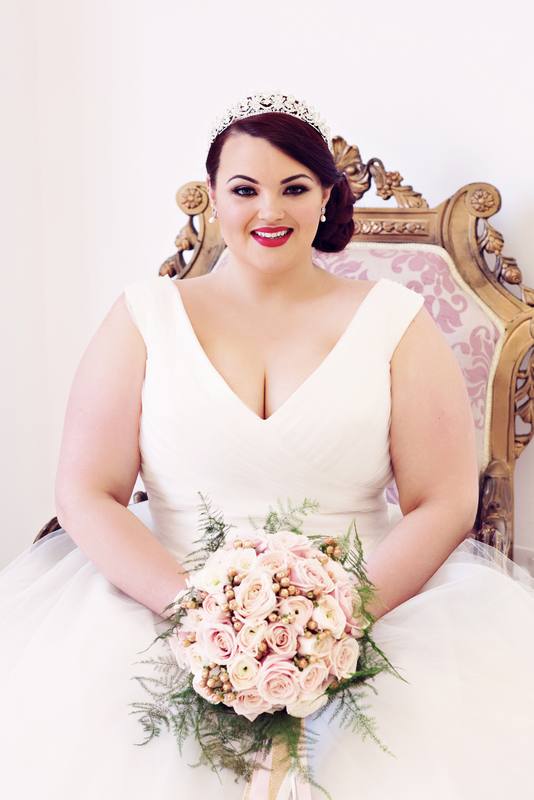 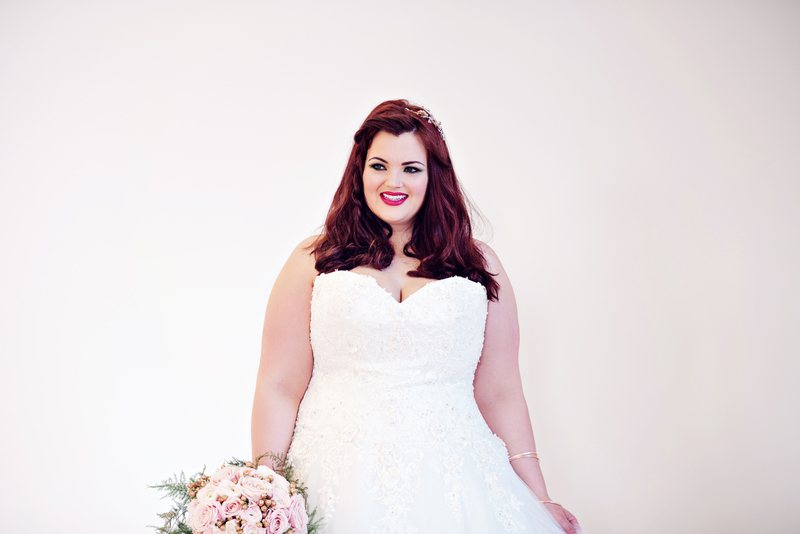 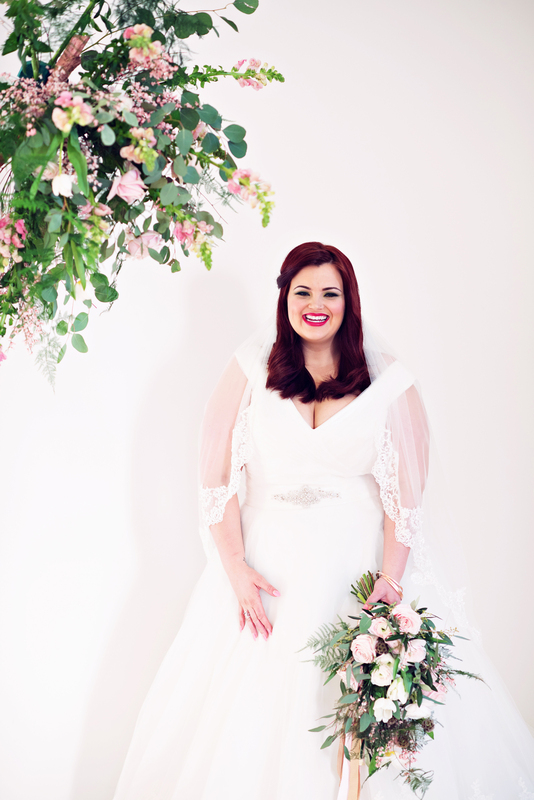 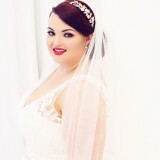 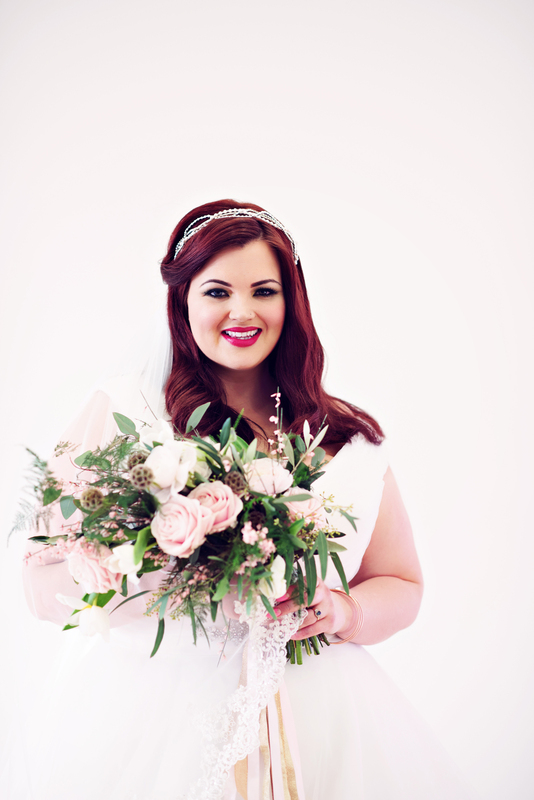 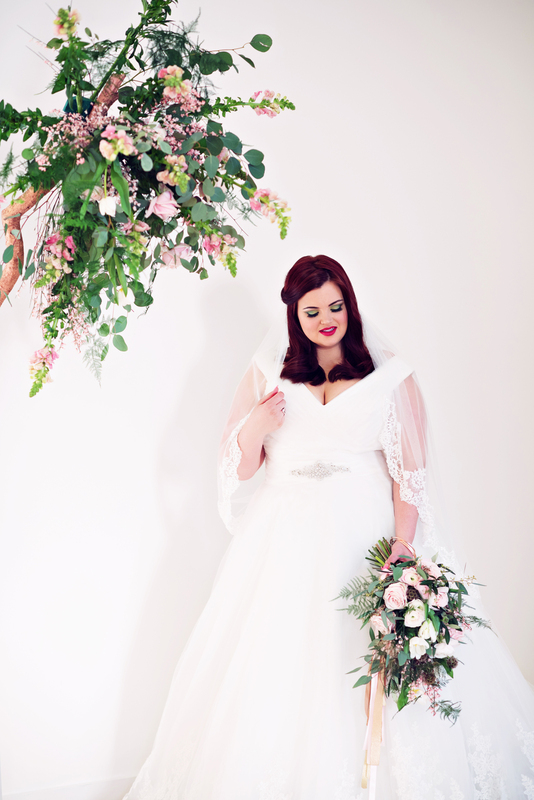 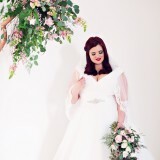 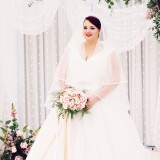 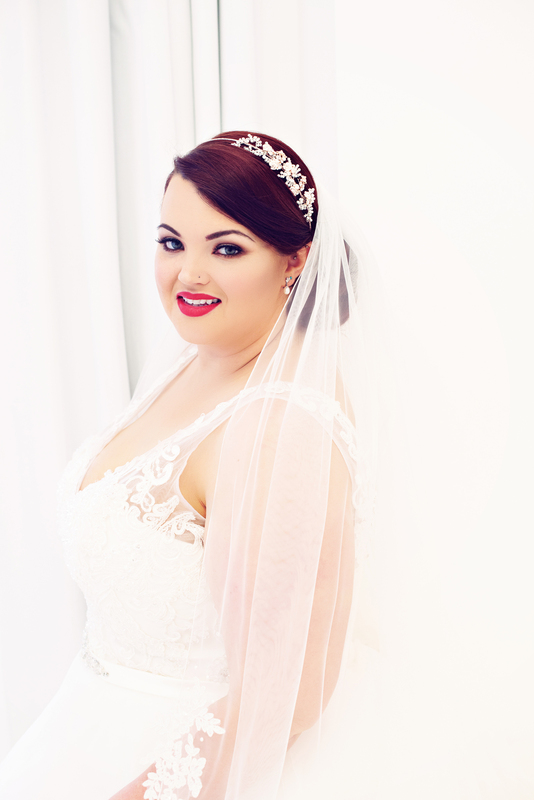 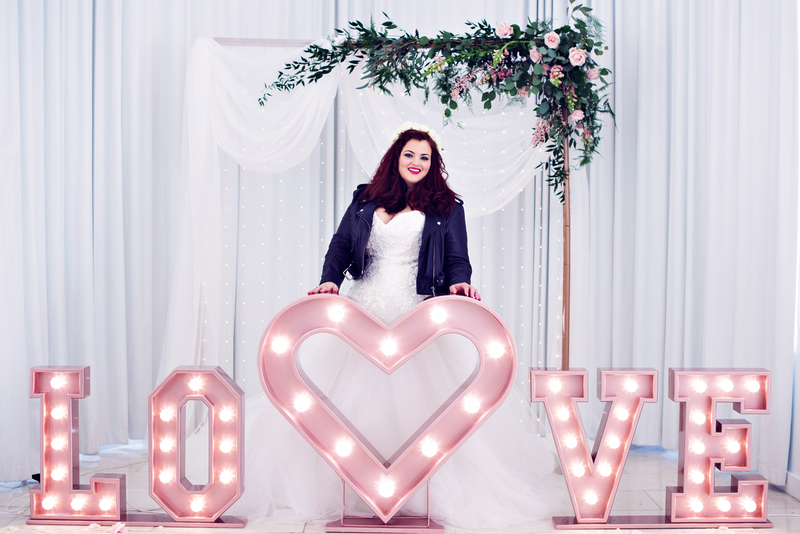 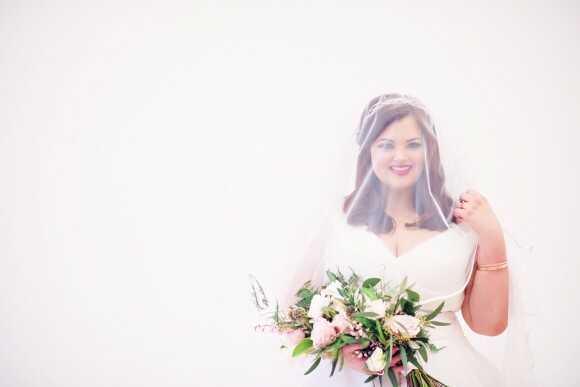 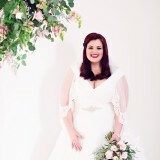 Led by Rebecca Lord-Lyon, a fellow rose-gold lover and owner of Cheshire’s award-winning plus size bridal boutique, Edith & Winston Bridalwear, this shoot demonstrates beautifully how to incorporate this magical metal tone into various elements of your big day. 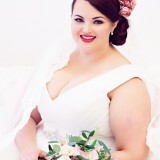 With images by Teresa C Photography. 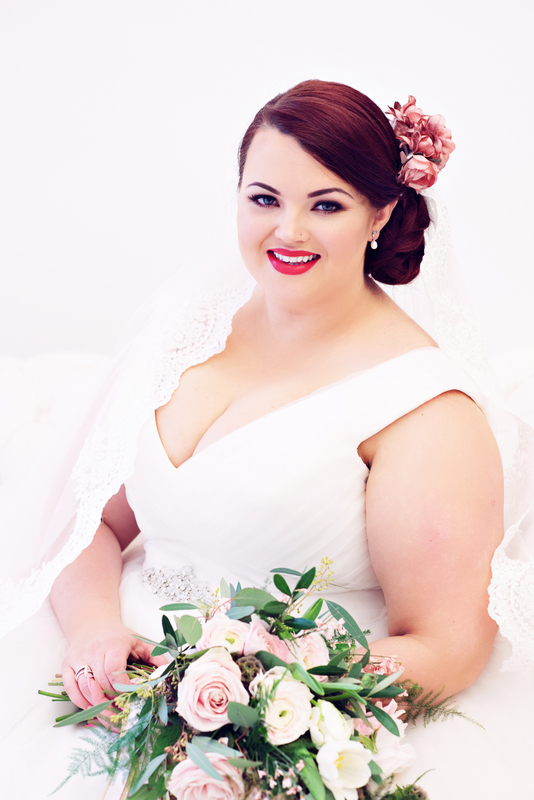 Model: Georgina Horne. 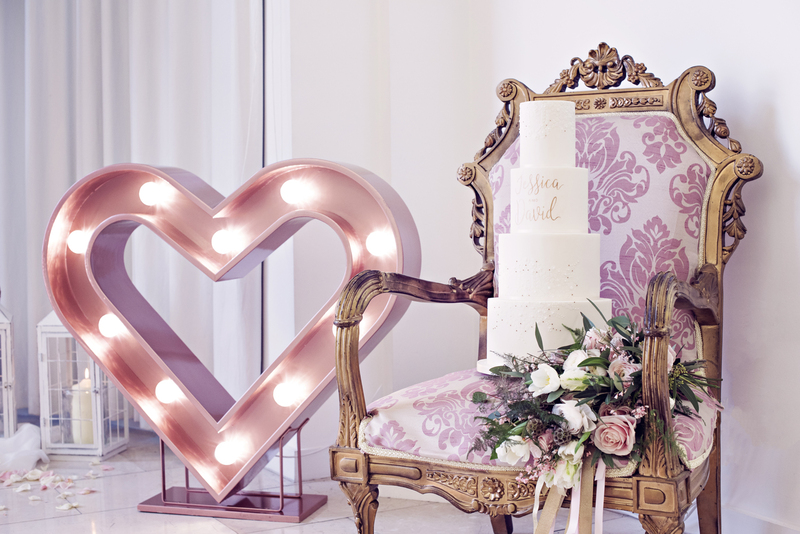 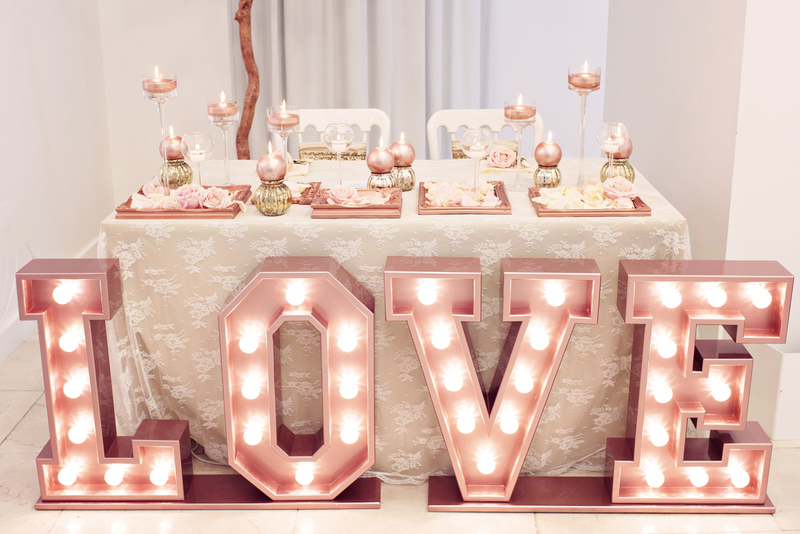 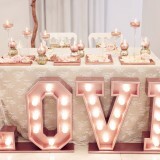 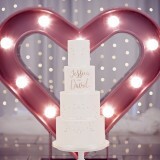 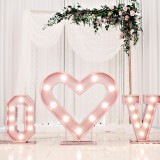 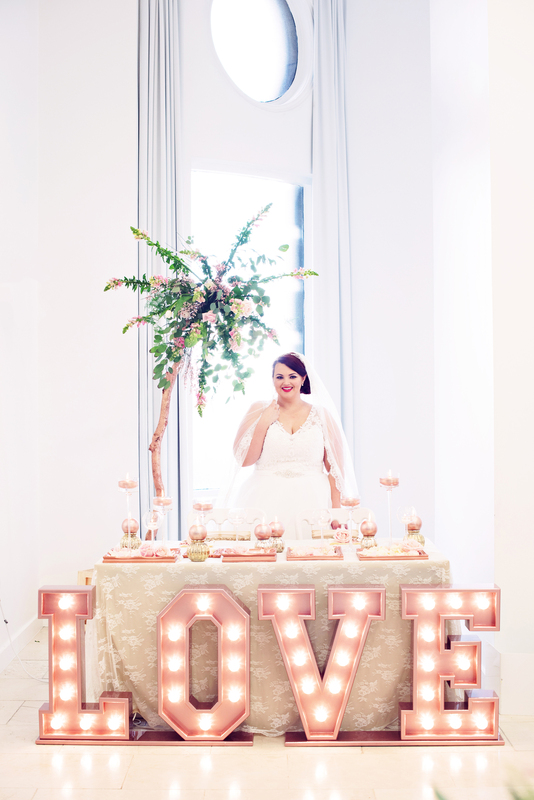 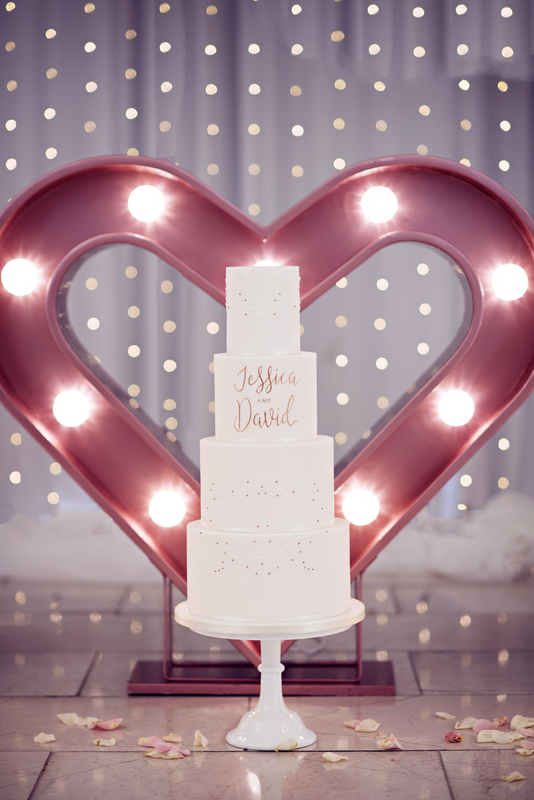 rebecca says: The shoot was inspired by a new product created by Stacy from Love Lights The Way – a beautiful rose gold, light-up love heart called ‘Lola’. 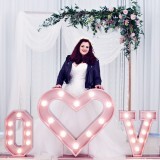 The unique, light-up prop quickly became a massive hit with brides and after seeing Lola for myself at a wedding fair, I also fell head over heels for her and so spoke to Stacy about collaborating on a special photoshoot. 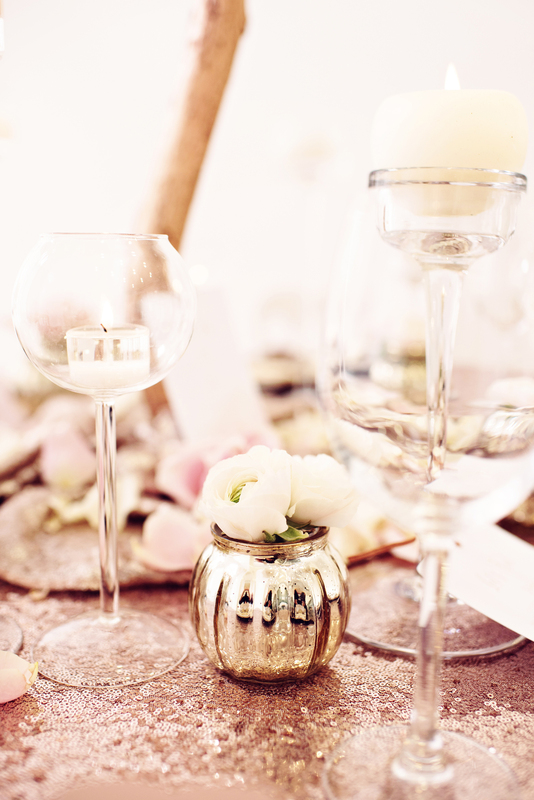 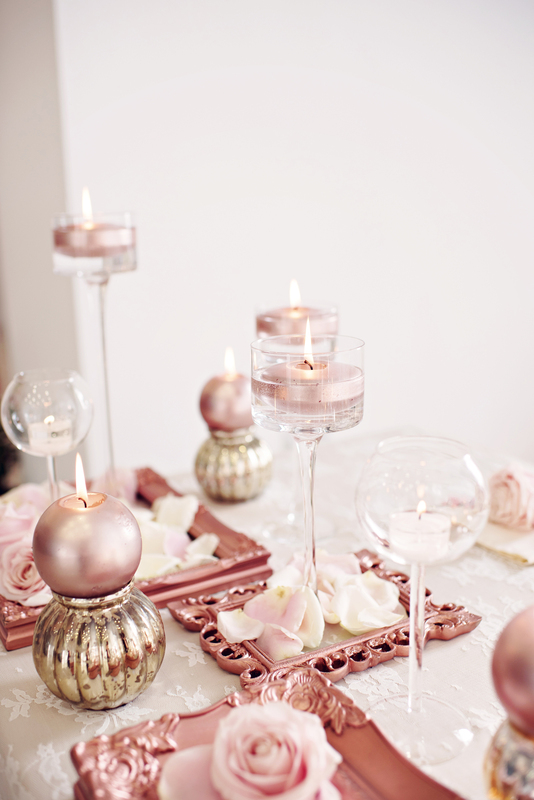 Rose gold has become a very popular colour – it’s everywhere this spring; interiors, fashion and it’s a growing trend in weddings too. 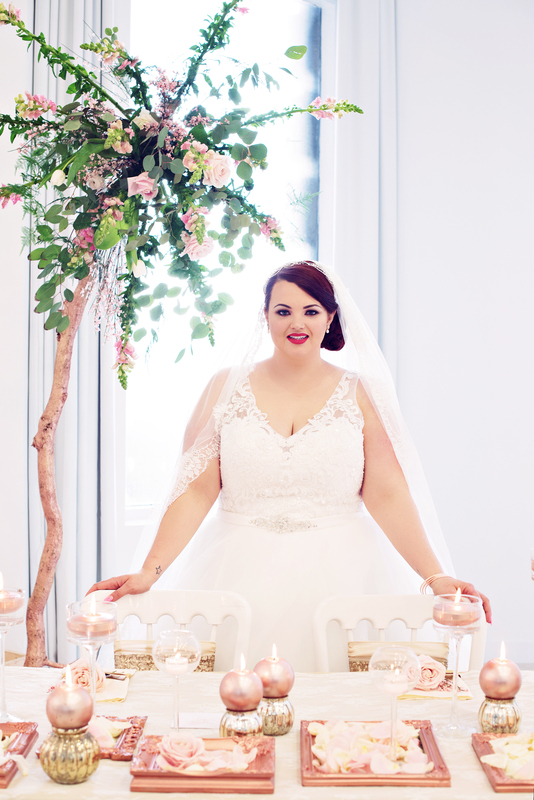 We therefore wanted to create a shoot together that would show our brides how to use this pretty colour for their big day. 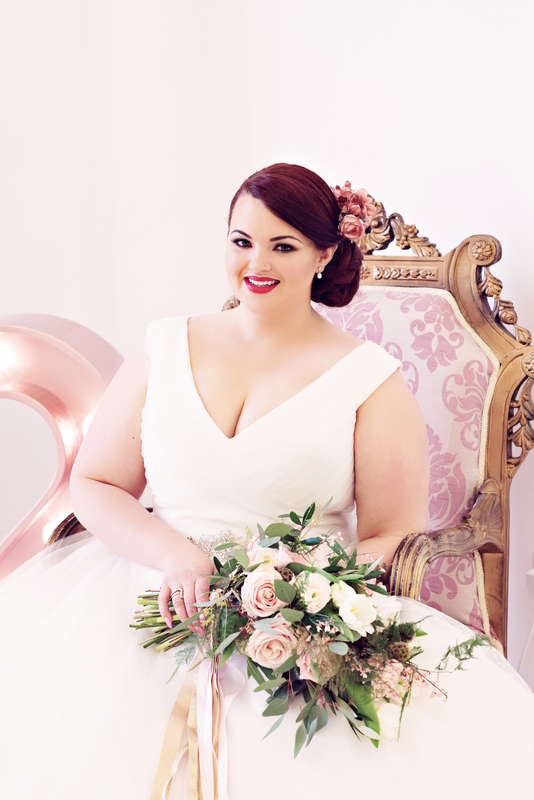 Stacy decided that the shoot was the perfect opportunity to introduce some more unique, rose gold pieces to her collection and so we used the shoot to launch these products alongside our brand new bridal accessories by Richard Designs. 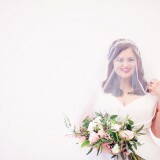 I knew that Teresa, of Teresa C Photography, had to be our photographer. 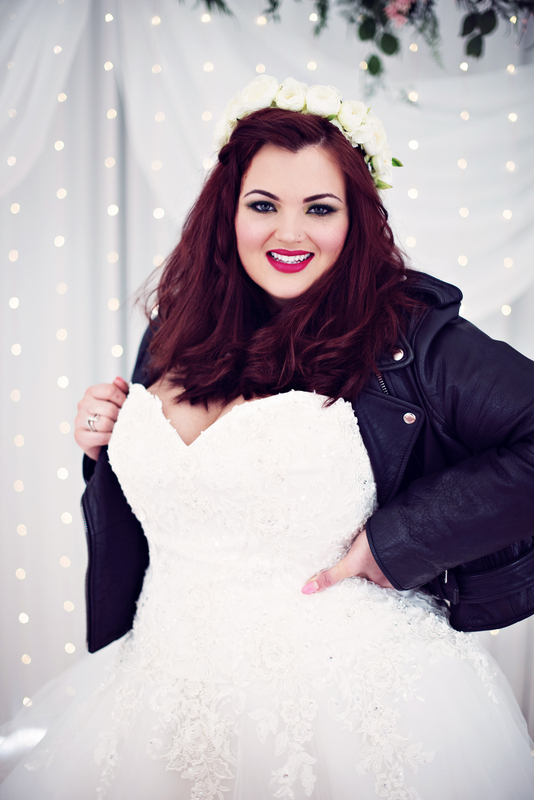 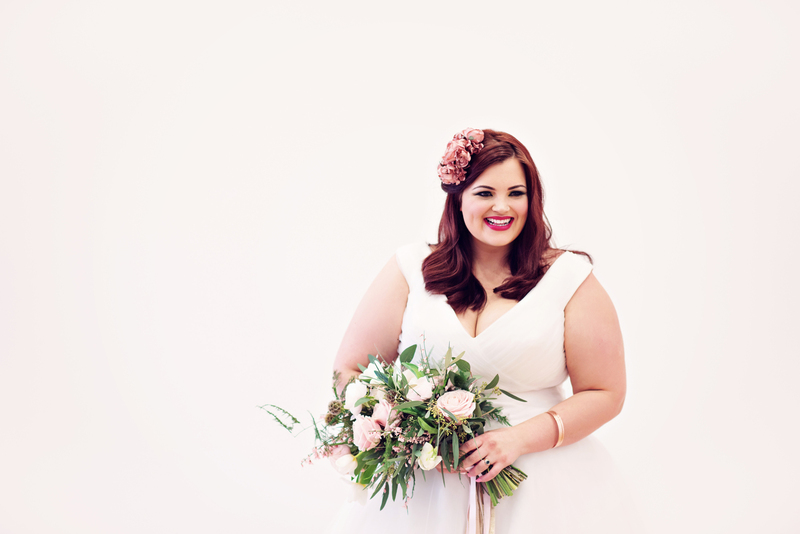 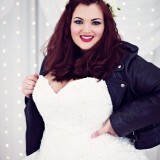 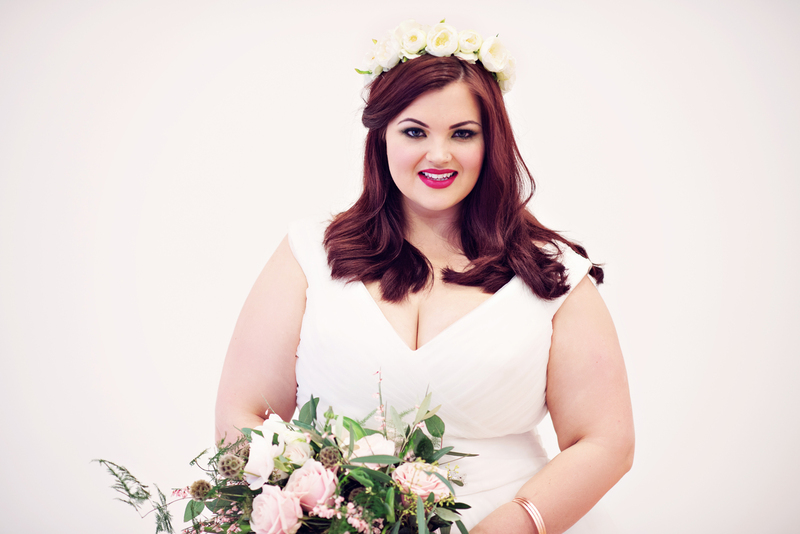 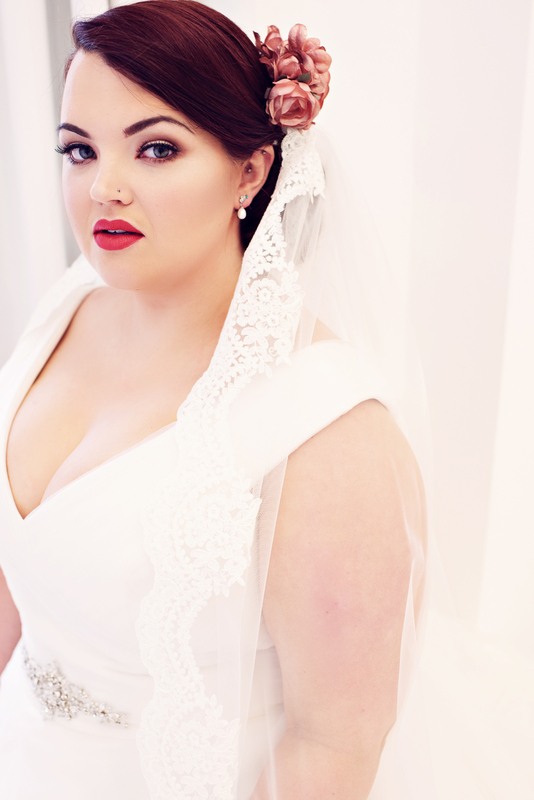 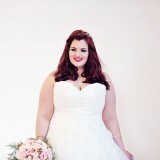 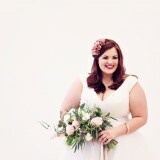 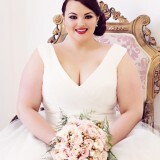 Having worked with her before, we knew she could capture the plus size model beautifully. 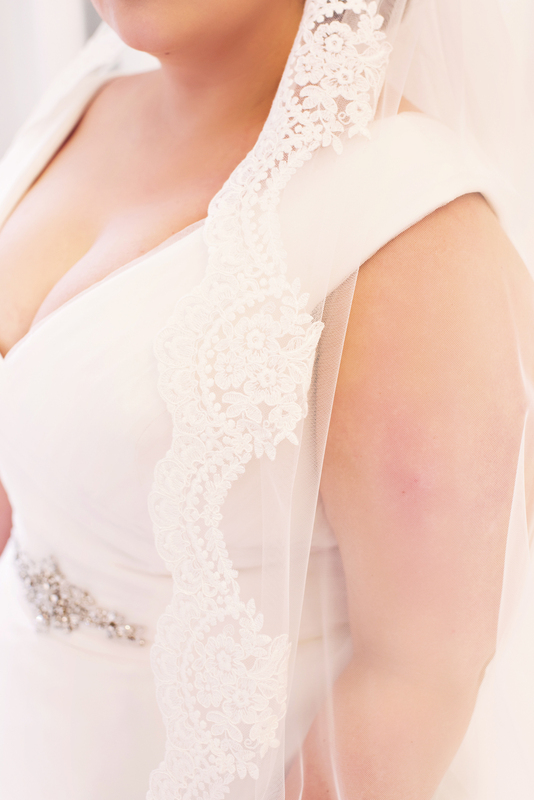 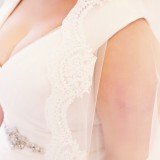 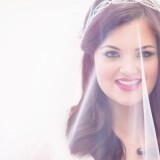 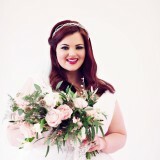 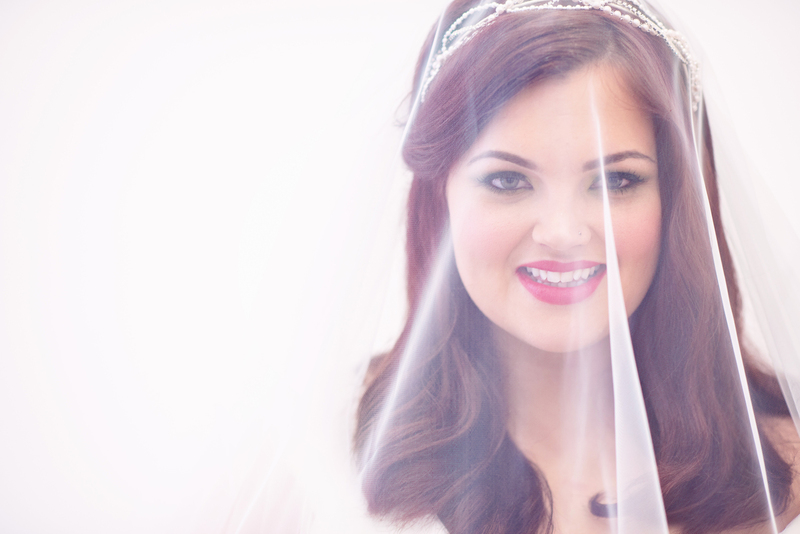 Teresa is an amazing photographer and has worked at so many of the North West’s wedding venues. 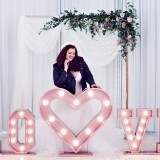 For this shoot she suggested Liverpool’s incredible The Venue at the Royal Liver Building, as our location. 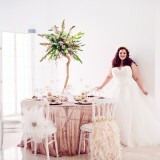 We trusted her instinct and she wasn’t wrong; the venue has clean lines, pure white walls and perfect lighting. 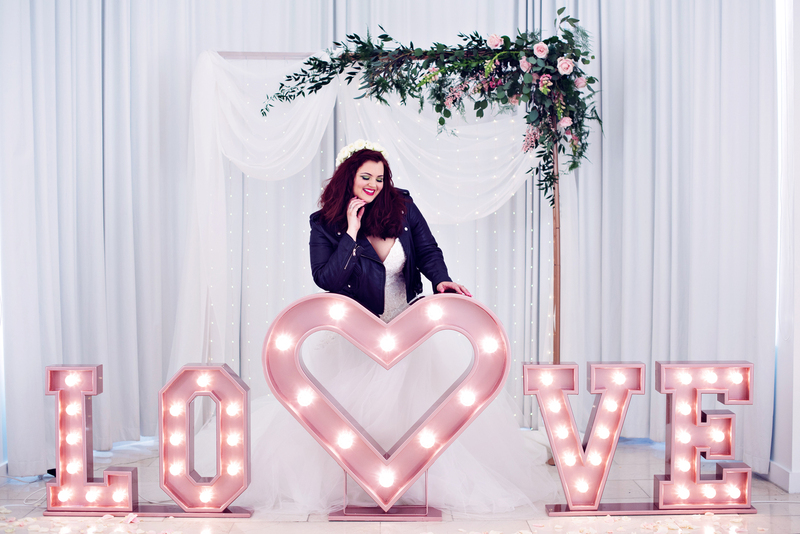 And so, on the windiest day of the year, our team of fabulous handpicked wedding suppliers, came together to pool their skills – even Storm Doris couldn’t get in the way of this photoshoot! Precious Things were simply given the colour scheme brief of rose gold and ivory, and then we let their imaginations run free. As event stylists, they teamed up with Stacy to create the most incredible setting for our shoot, which even included a metallic rose gold tropical flower tree! 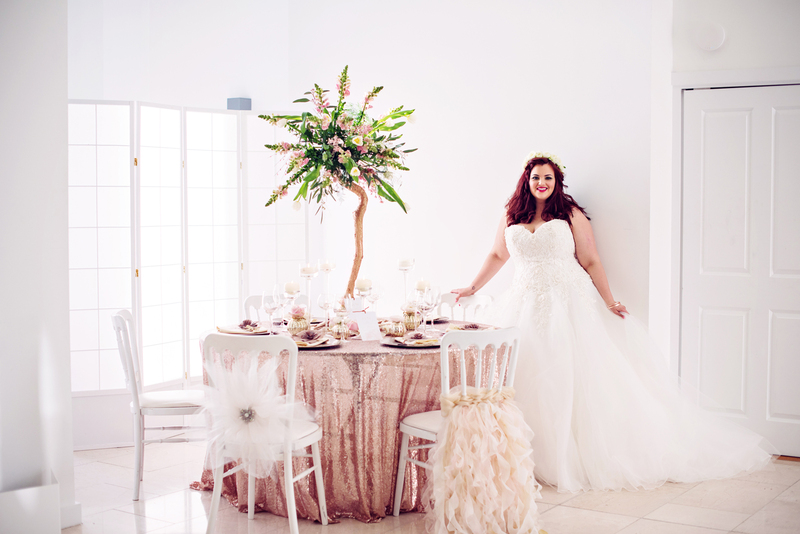 The aim was to create a look that was eye-catching and elegant as well as relaxed. 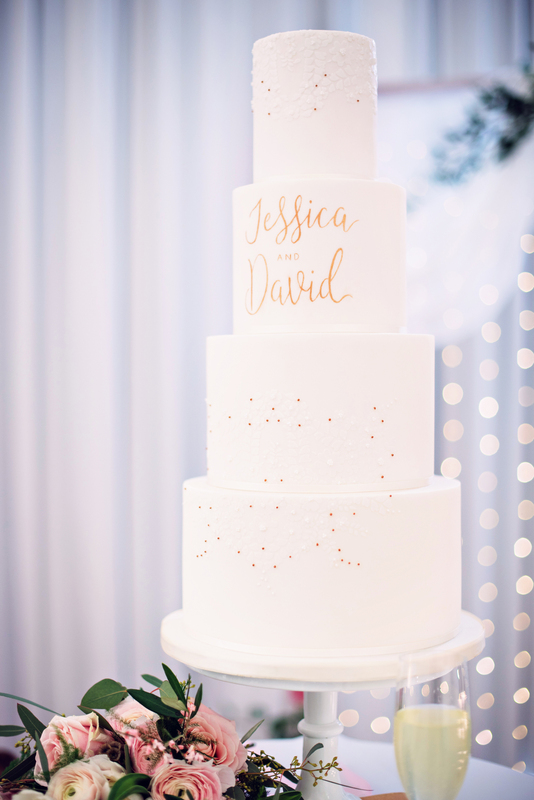 They coupled rose gold sequinned table cloths with bespoke ivory frothed chair covers and handmade the copper-coloured paper flowers that were on each place setting. 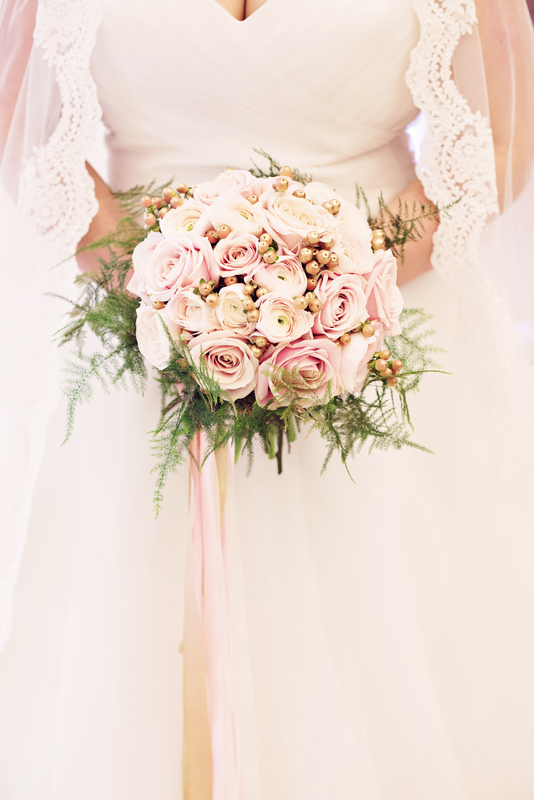 For the bouquets, they used Tulips, Roses, Scabiosa Seed Pods, Broom ‘Genista’, Asparagus Fern, Berried Eucalyptus, Sweet Avalanche Roses and Success Hanoi Ranunculous. 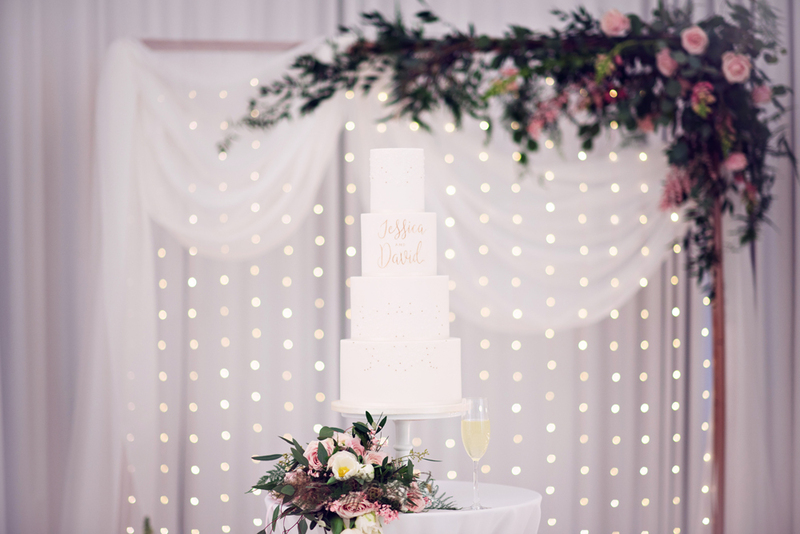 The trees were made to be multifunctional: the smaller of the two was the perfect spring centrepiece for the decadent sequinned guest table. 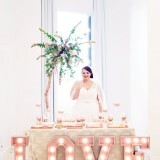 The larger was a fabulous backdrop. 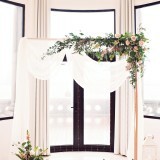 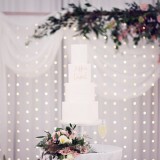 The bark of each tree was sprayed rose gold to glam up the loose yet pretty arrangement at the top. 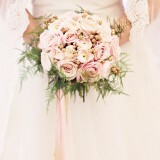 Additional flowers used in the trees were Snapdragons and Broom. 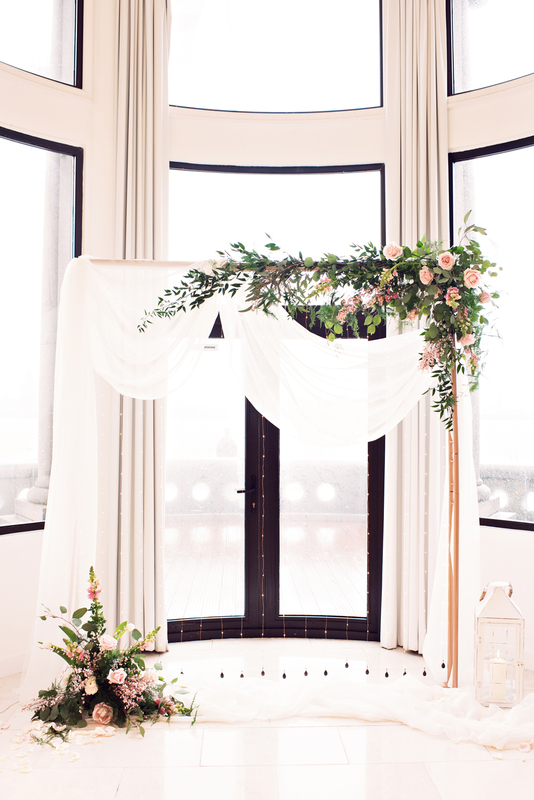 The backdrop structure was dressed with ivory voile and an abundance of foliage and flowers, which could either be used as an arch to say ‘I do’ or a photo backdrop to rival any photobooth. 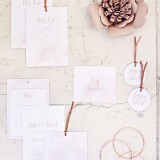 Stationery-wise, I kept seeing the stunning work of wedding stationery designer Lianne from LoveLi, and so asked her to be involved. 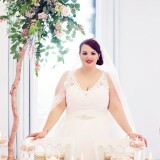 I explained to Lianne my vision for this shoot and she said the colours were right up her street. 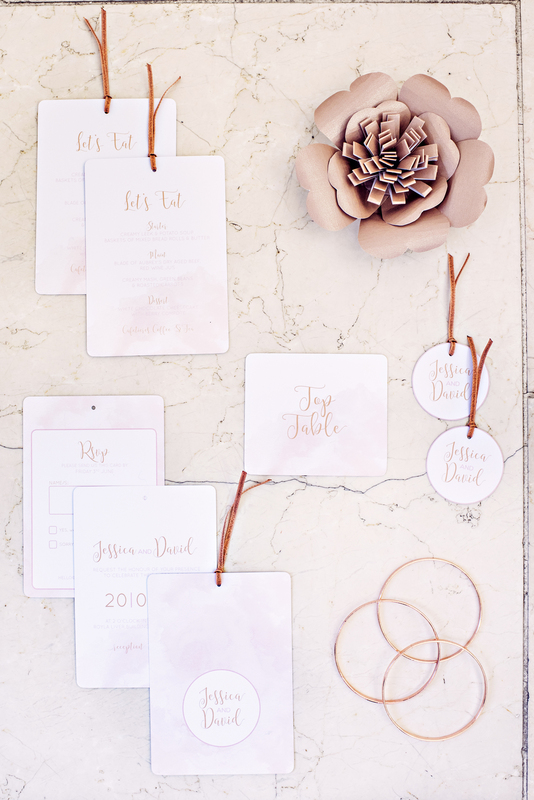 Lianne insists that attention to detail is extremely important to her, and this is clear to see as she created the most beautiful rose gold wedding stationery set for us. 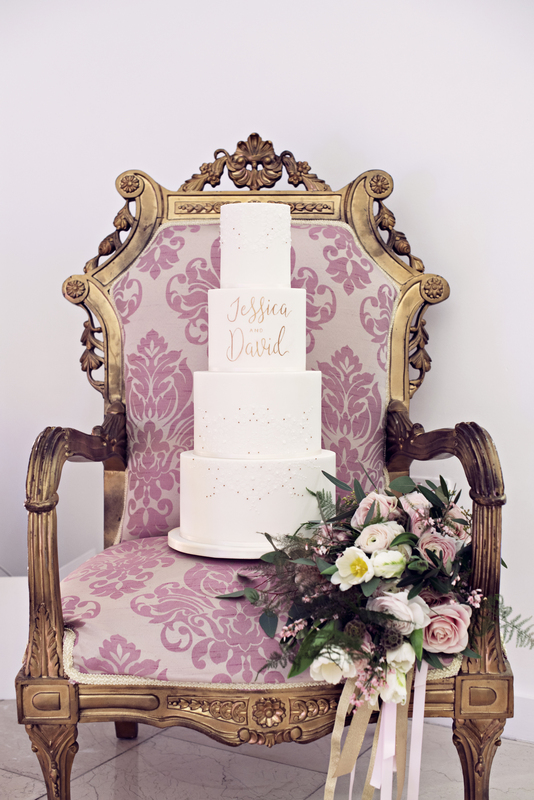 Marie Antoinette Cakes used the venue for inspiration and created an elegant, four-tier, ivory wedding cake, decorated with delicate appliqued flowers and hints of rose gold. 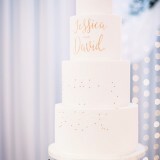 She also incorporated LoveLi’s stationery design by hand writing “Jessica & David” onto the cake. 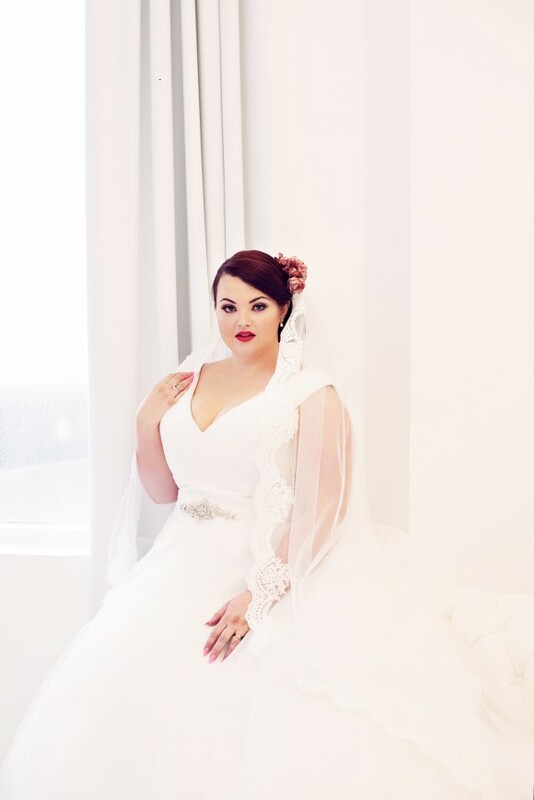 For the hair and makeup side of the shoot, Flossy & Leigh Bridal Styling Company was inspired by the classical and simple elegance of the Ronald Joyce gowns worn by our model. 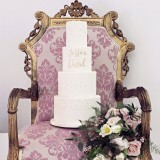 Working with them, we opted for classically elegant – even regal – styling, but with a contemporary feel. 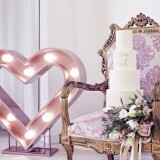 Ultimately, we were aiming for a perfectly polished and ultra-groomed finish. 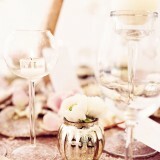 Playing to the springtime element of the brief, we kept it fresh and clean. 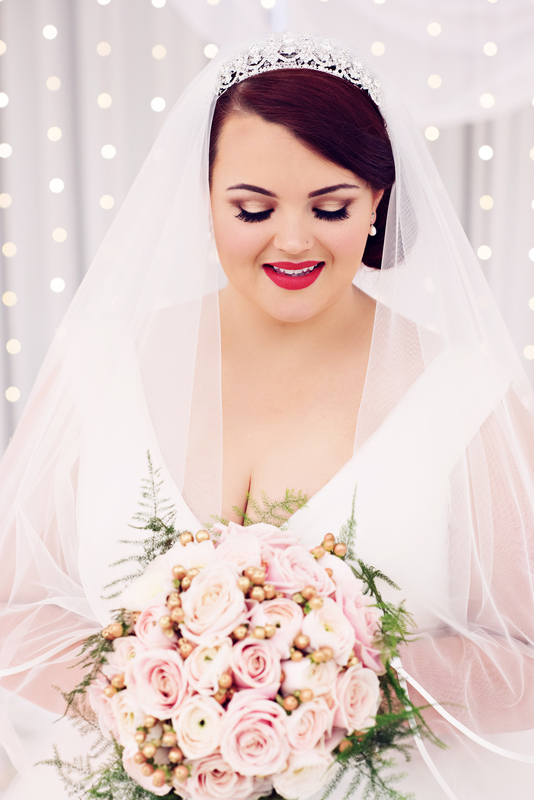 For one of the looks we had a bit of fun by introducing a colour pop element – bright fuchsia lips, with a vivid lime and leaf green smoky eye. 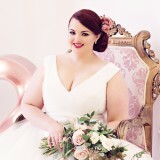 All our Ronald Joyce gowns stocked at the boutique are well known for their structured bodice, fit and elegant designs, and these new ones featured in the shoot are no exception! 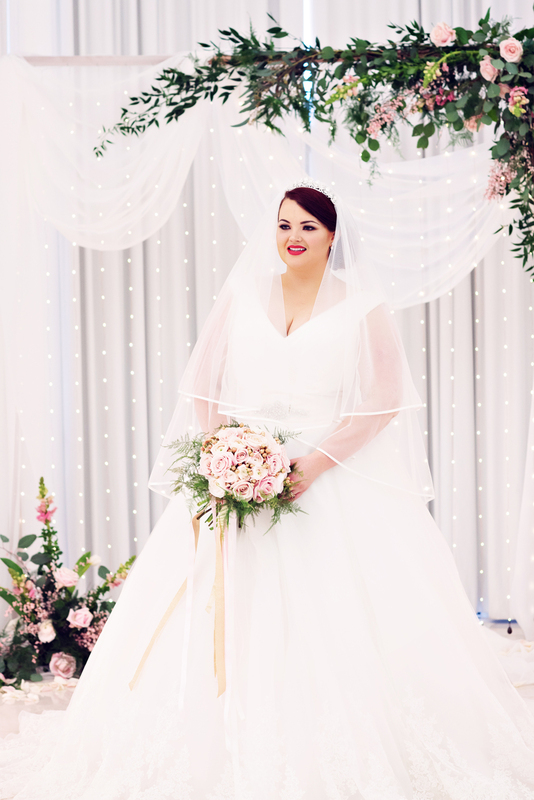 They provide brides with a luscious and diverse selection of shapes, colours and fabrics to help reflect their own individual style and availability ranges from size 6 to 30.